the passing on of our dearly beloved father, granddad, great granddad and ‘Uncle Ron’ to many of our immediate neighbours, friends and local whanau. He was married to my whanaunga Rangi Hakaraia, daughter of Tiaroa and Rongo​, for nearly 60 years.​ Ron and Rangi lived in Wellington in the early years, where Ron was a Public Servant chauffeuring politicians and visiting State dignitaries around ​the ​​​Wellington​ region​. They moved to Auckland later where he continued this mahi till his retirement. Throughout his life he visited Te Rawhiti with Rangi and their whanau. He was always present at working bees in the early days when the whare hui was moved and the whare kai was built. 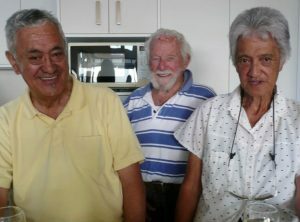 When ​Ron​ retired from​ the​ Public Service​ garage​, he and Rangi moved home to Whiorau with Arthur, where he continued to work on the whenua there. I ​can actually​ say he worked harder after he retired than when he was employed! He was always working on something​ and kept the Homestead at Whiorau looking immaculate even when he no longer lived there – they couldn’t keep him off the lawn mower and a coupe of times the lawn mower bucked him off! but he still got back on it.​ ​For years he maintained the urupa at Te Rautawa, and also mowed the lawns at our marae. When the late Kura Beale was still resident at Kapua Te Rangi, Ron would often lend a hand on her property. When Kura was admitted to an Age Care Residence, a ​c​aretaker was appointed by Kuras brother and Ron ​worked there for a time. When Kiri Te Kanawa inherited the property after Kuras death, she had a cottage built at Kapua Te Rangi for Rangi and Ron to live in and Ron began his life as caretaker. Kiri built another house later for Ron and Rangi to live in when she felt he needed to retire from Kapua Te Rangi. He and Rangi lived there and he continued to live alone after he lost dear Rangi, right till his passing last week. We will all miss ‘Uncle Ron’​- particularly his Thirsty Thursday mates.​ Every Thursday evening for the past few years, Ron invited his neighbours, whanau and others in the community who wanted to go – up to his whare for drinks and nibbles. ​Our​arohanui go to his children and mokopuna who will feel the loss keenly and we pray they keep strong together as their parents would want them to. i te mate ki te ora. crossed over from this troubled world to the world of eternal living. Rest in Peace.